Among the pleasures of this world the frescoes of Tuscany occupy a special place. Distributed throughout a most human European landscape the monasteries and churches that house them are uncrowded if not empty. No long ticket lines or tour groups harass the visitor. Small hotels and restaurants make the journey a delight - one or three leisurely weeks will allow you to see only one place at a time. These paintings are the beginning of the Renaissance: S. Francesco in Assisi, two churches one on top of the other, their walls covered with murals, is one of the birthplaces of European art: Cimabue and Giotto's earliest paintings are here Not all are eclectic: the bucolic frescoes of Mommo di Filippuccio and Lippo Memmi in San Gimignano, Bartolo in the Spedale Santa Maria della Scala in Siena, or Il Sodoma's cloisters in the Abbey of Monte Oliveto Maggiore may not be comparably high art but are a graceful variation and give a lively picture of the tre- and quattrociento. Florence, the treasure house of Tuscany, requires a week of its own, even if one were only to see its frescoes: The Brancacci Chapel in Santa Maria del Carmine, Uccello's badly damaged haunting paintings in the Green Cloisters of Santa Maria Novella, Fra Angelico's minimalist paintings in the Convent of San Marco are counterbalanced by Gozzoli's colorful picture-book cycle of the Magi in the Palazzo Medici-Riccardi and Ghirlandaio's superb portraits of the members of the Tornabuoni family in Santa Maria Novella. Two painters stand by themselves Piero della Francesca and Potormo. The first, because he is such an obstinate individualist as to tax the imagination of the beholder - yet his frescoes are among the greatest creations of all times. The second, Jacopo Potormo, does not really belong into this collection - and is virtually unknown, despite we all have walked by Santa Felicitá in Florence innumerable times. Why today? Some of these paintings have been around for 700 years. Most can be found as marginal notes in the guide books, and they have long been examined by the art historians. The reason for my excitement is that the majority has been superbly restored during the past two decades. They are in better condition than many a panel painting in the famous museums. This Google-Earth map, copied from my GE post Frescoes and Painters of Tuscany, shows the locations of the paintings in this essay. To open the kmz-file you need to have Google-Earth installed on your computer. The essay presents an illustrated survey of the Renaissance frescoes in Tuscany between 1200 - 1600. Each painter is briefly introduced together with a representative selection of his work. The excuse for this choice is that many of the most notable frescoes have recently been superbly restored: A feast for the eyes. 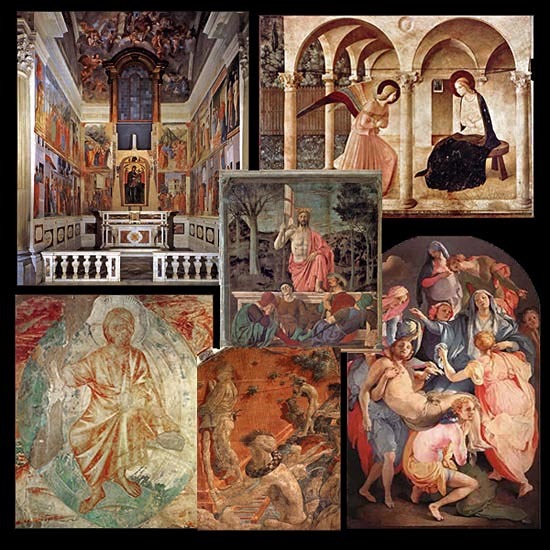 Paintings other than frescoes, altar panels and paintings in the museums, are only shown in a few cases for illustrative purposes. On the other hand, I did include a few places outside Tuscany, because they are of importance to the development of fresco painting in that area.